Don't Like "Sales Leads"? That's OK - We have the plan for you! Pay nothing until you close the deal. How's that for mitigating risk? We will set you up on our system in your local market. We will advertise your business and generate leads for you in your local market just like we do with our other products. You simply pay us when a deal is *funded. This takes all of the risk off your shoulders to advertise. We are looking for good business partners to work with. We will evaluate your market and evaluate your business strategy and if we are a good fit we will partner with you based on a commissioned sale. How to we monitor this process is by ensuing that you are meeting certain sales objectives. If you are not closing over 10% or not being honest about the sales that we are bringing you we will discontinue the service. (Very Simple really.) Our on our traditional services are closing around 18% of the leads that we send them. 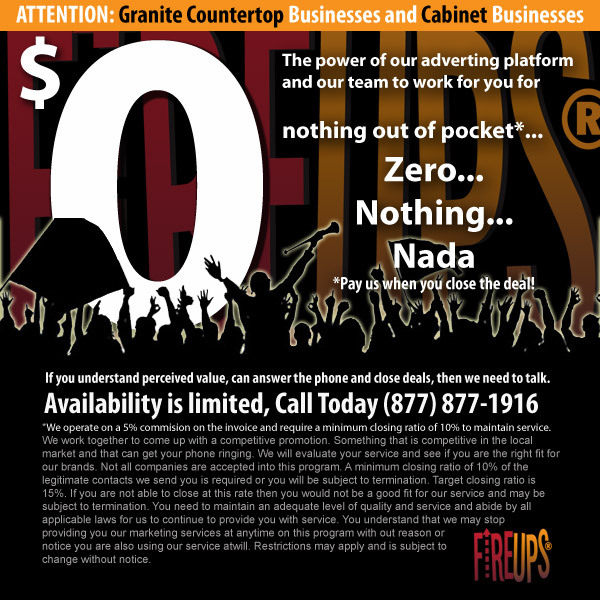 If you want more business tomorrow partner with FireUps today! complete this form and we will review and contact you. *We operate on a 5% commision on the invoice and require a minimum closing ratio of 10% to maintain service. We work together to come up with a competitive promotion. Something that is competitive in the local market and that can get your phone ringing. We will evaluate your service and see if you are the right fit for our brands. Not all companies are accepted into this program. A minimum closing ratio of 10% of the legitimate contacts we send you is required or you will be subject to termination. Target closing ratio is 15%. If you are not able to close at this rate then you would not be a good fit for our service and may be subject to termination. You need to maintain an adequate level of quality and service and abide by all applicable laws for us to continue to provide you with service. You understand that we may stop providing you our marketing services at anytime on this program with out reason or notice you are also using our service atwill. Restrictions may apply and is subject to change without notice. Many "lead providers" have given online marketing a bad name. Let me explain why our Internet Sales leads are better - User Experience, Increased Conversion, Trackable results. With our process we deliver content to them about your business before they become a lead. (Think about that for a second) We wrap your information into our professional website design and our online tools that help the customer help themselves. Our system of tracking and connecting you to the customer is designed to be as real-time as possible instantly connecting you to calls and sending estimated and lead data to you via email in real time. I am not sure that you can find a more powerful advertising platform for your business with this little risk anywhere.